signpost at his father's old farm. Paul Kleynhans, who lives in Pretoria, South Africa, is lucky that his parents didn't name him after his birthplace, as were two of Australia's Prime Ministers: Mr. (later Viscount) Stanley Melbourne Bruce, who was born in Melbourne, and Mr. (later Sir) Earle Christmas Grafton Page (who was not an Earl), who was born in Grafton (but not on Christmas Day). More recently, the son of Victoria (“Posh Spice”) Beckham and her soccer star husband David Beckham was named Brooklyn because he was conceived there. Paul was born on a farm named Tweebuffelsmeteenskootmorsdoodgeskiedfontein. That's the Afrikaans word for "two-buffaloes-with-one-shot-starkdead-shot-fountain". If his parents had given him that mouthful as a middle moniker, he would have taken ages to complete documents requiring his full name. We first heard of that 44-letter tongue-twister two years ago, and wrote a story about it. After it was published in this e-book, it lay dormant in the archives until Paul discovered it last month. He posted a message in our GuestMap, and we then invited him to recount his remarkable story. The farm Twee Buffels (Two Buffaloes) where I was born is about 30km east of Lichtenburg in the North West province in South Africa. According to my dad who has now passed away there was a farmer in very late 1800s that killed the two buffaloes with a 303 "Lametford" ( don't know the correct spelling) rifle. He killed both of them with one shot and since that day that farm was named in Afrikaans Tweebuffelsmeteenskootmorsdoodgeskiedfontein. Some maps in South Africa displayed the name a few years ago as the name made the Guinness Book of Records as the longest name for a farm. I don't know if this record still stands. In the 1950s, my father, Paul Petrus Kleynhans, bought the farm and lived there with my family. We lived on the farm till 1965. My dad was a well known farmer in the Lichtenburg district. He developed the farm and built a church for the farmworkers on the farm. One evening we had a severe storm on the farm and my father was very concerned about the newly built tractor shed and as he walked out of the house he heard a massive noise like an explosion. The house was covered in dust and he realized that the roof of the entire house had been blown off. He gathered all of us in the car. We had a 64 Chevrolet Impala and the wind was so strong that it felt like a boat on the sea. The next day - it was on a Sunday - the whole community helped to repair and replace the roof on our house. I can't really remember this but that is what my sisters have told me. I am 44 years old and the youngest of five children in our family. I together with my brother and his wife started a business in Pretoria 4 years ago. This is really amazing as my dad always used to drill it in our heads to work together as a team as he had some insight in the future. Today my brother is my best friend and we get along very well as he is the technical guy and myself the administrative guy in our business which is called High Standard Projects. I am married to Madelene, a teacher, and we have two boys, Reuben 12 and Calvin 7. They are diamonds in my life. I am so proud of my family because we have a great story of our own! Briefly I'll tell you. My parents were very poor when they were young but my dad worked hard and became one of the wealthiest farmers in the former "Western Transvaal." My parents were a very handsome couple and three daughters were born. My dad was a bit sad because he had no boys to inherit his farms. In those days it was practice that only a boy could inherit a farm. Five years after our youngest sister was born, my brother saw the light, to my dads delight and one and a half years later I was born. My dad was so happy and said that my brother and I were the two buffaloes of "Twee Buffels" which is the direct translation. As my dad expanded his farms he started to entrust white managers to run his farms. My dad helped so many people financially. 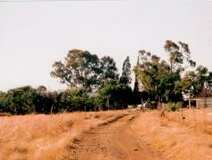 At that time my dad worked on a beautiful farm in the Limpopo province with the means to buy it if it was profitable. It was then that my oldest sister discovered that the rest of my dads farms were not given attention to. These white managers that my dad had were jealous of my dads progress and because they had signing rights on my dads account they bought tractors and implements worth hundreds of thousands of rands and sold it in the "Free State". When my dad discovered what happened all creditors slammed on my dad and he asked for postponement of the outstanding accounts until the harvest was in and they wouldn't. My dad discovered there was a plot against him and after he sold about everything he had, R16000 was all that was outstanding. They wouldn't give him grace. We lost everything when I was about 9 years old. We moved to a neighbouring town and worked for another rich farmer. I respect my parents so much as they never turned to alchohol in the hard times, they never held grudges, never let bitter took over. They stood with us through thick and thin. It was not nice being a very well off family and it was hard to see how my parents struggled to make ends meet. In later years, I had difficulty making peace of what happened to us as I was robbed from being able to go to university as we had no funds. My sisters were married but it was my brother and I who really struggled. I was a salesman who worked on a commission basis only, and it was tough to provide for all the needs in our family. The only thing that kept me going was my faith in God and the love for my family. Then one night I had another dream. In the dream I saw a small boat in the ocean and it was busy sinking and I saw myself helping this little boat to get to the docks. The boat broke into pieces and I saw myself and my wife clinging onto one of the pieces that was flying through the air. We landed on dry ground without any harm to us. I wondered about this boat and then someone came to me in the dream. I couldn't see his face and I told him what happened. He said to me that the little boat was never our boat and he said to me: "Look, that boat is for you" - he showed me a passenger liner that was docked in a harbour. It was a glorious sight to see as it was shining with lights all over. I turned around to the man who spoke to me but he was gone and the dream ended. I held onto that dream and 2 years after the dream, my brother approached me to ask if I would manage the business that they were going to open in Pretoria. Today, I am one of the owners of the business and we are very successful. Both dreams came to life and now the "Two Buffaloes" have restored the family name and we now have more than what we ever could have asked for. All the people who contributed to my father's downfall died before him or lost more than he did as he never sued or persecuted those people. And now, the two buffaloes of "Twee Buffels" are alive and well today. We still have black and white photos of the farm Tweebuffels and some 8mm films. I want to take my wife and 2 boys to the farm very soon and will see if I can get a photo of a noticeboard displaying the name. I will keep in touch. We did go to Lichtenburg in the North West Province to look for our farm. We discovered that it has been subdivided and consists of about five farms now. We first travelled into Lichtenburg and looked at previous properties that we owned and where we stayed. Many happy memories came back as we drove through the town. Most were still the same but I could see it wasn't the same anymore. We then went out on a sand road as I could vividly remember and I said to my wife that we need to look out for any road sign. We were travelling quite far when we passed a road to our left but there was no sign. 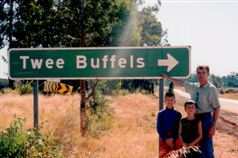 We passed the turn-off and as I wanted to go further on my wife shouted there it is, the sign of "Twee Buffels"! I turned around and we stopped to take a photo. We were so happy, although it was the shortened name and not the whole long name, suppose they couldn't make a noticeboard that long. We travelled in that direction and came to the farm that was my place of birth. The new owners built a new house next to the old house, but its amazing what I've remembered of our farm like the old massive Bluegum trees in front and at the back of the house that are still standing there. There was a moment when I felt sad, but then also happy that our lives have turned out well. I longed for my dad for what a MAN he was! ...maybe one day I will tell the whole story in bookform for he deserves that.